Melina delivers homemade, frozen pasta to our farmer’s market! Ok, this post isn’t really a “farmer”, rather a wonderful, local pasta maker who sells her homemade pasta at some of our local farmer’s markets. Melina’s pasta has quickly become a staple in our house. Dried pasta has its place, but buying fresh pasta (we purchase it frozen) has given us the not-so-subtle reminder that when it comes to all foods, fresh is best. Ellie loves this pasta and remarked right away at how flavorful it is and what a great texture it has. So maybe she didn’t eat the roasted vegetables I served with the pasta, but at least she had spinach fettucine! The spinach fettucine has by far been our favorite so far. We have tried it with roasted vegetables (see below) and with sautéed scallops and lemon (super yum!). I think next week we might try some ravioli. If you are in Raleigh, stop by the Melina’s booth and sample some wonderful recipes she puts together with ingredients from other vendors at the market! Great way to find out how to put your market treasures together for a meal. Here is a revised version of an earlier recipe we posted using roasted veggies tossed with pasta. The result of this experiment was light, so flavorful and a great way to use vegetables from our Produce Box! This is what we made with our seasonal vegetables, but you could use any vegetables you have handy. Definitely, don’t leave out the onion! 8 oz. frozen Melina’s spinach fettucine (1/2 bag); dried pasta works, too! Pre-heat oven to 400 degrees. Line a rimmed baking sheet with foil. Set aside. In a large mixing bowl, mix together all chopped vegetables + herbs. Drizzle with olive oil to lightly coat and sprinkle with salt and pepper. Pour vegetables onto rimmed baking sheet and distribute to make an even layer. Put sheet in pre-heated oven and roast vegetables for 30-50 minutes (this really depends on how roasted you like your vegetables–we roast ours from almost an hour). While vegetables roast, heat a stock pot with water for the pasta. Bring to a boil. When vegetables are about done, add salt and pasta to the boiling water and cook according to directions (fresh/frozen pasta will take only 4-5 minutes). Reserve 1 cup of pasta water for sauce. Remove vegetables from the oven and put in a large bowl. Drain pasta, reserving 1 c. of liquid and add pasta to the bowl. Add cheese and reserved pasta water to the bowl and mix well. The heat from the pasta and vegetables will melt the cheese and the pasta water will make a light sauce. Serve up to your hungry family with a hearty thanks to Melina! Blueberry jam always seems like such a luxury to me and I’m not even sure why. 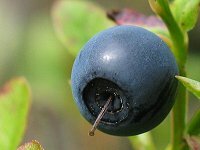 It’s not as though blueberries are rare, but somehow they seem a bit precious. They are not as treasured as blackberries, which will always be my favorite, but they’re still pretty special. North Carolina blueberries, when cooked, seem to have so much more flavor than they do when they are raw. I don’t think this is true of wild Maine blueberries, which are much smaller but packed with flavor. My Produce Box this week included a container of this year’s first blueberries and I added on 6 more to my order for good measure (!). What to do on an evening when Ellie has homework and Tom is playing softball? Make jam, of course! Just me and my boiling cauldrons of goodness bubbling away. Here is the recipe I used. Judging from the last bits that Ellie and I sampled from the bottom of the pot, this recipe is a keeper! It is from “Put ‘Em Up!” which is a terrific book on home food preservation. Combine the sugar and pectin in a small bowl and set aside. Combine the berries with a splash of water in a medium nonreactive saucepan and slowly bring to a boil over low heat. Add the lemon juice and calcium water. Stir. Pour in the sugar/pectin mix and stir to dissolve. Return to a boil and them immediately remove from the heat and let the jam rest for 5 minutes, stirring occasionally to release air bubbles. Skim off any foam. From here, you can ladle the jam into jars or bowls, cool, cover and refrigerate for up to 2 weeks. Or you can can the jam. To can, ladle the jam into hot, sterilized half-pint jars, leaving 1/4″ of headspace. Release the trapped air. Wipe the rims clean, center the lids on the jars and screw on jar bands. Process in a hot water bath for 10 minutes. Turn off the heat, remove the canner lid and let the jars rest in the water for 5 minutes. Remove jars without tilting them and set aside for 24 hours. Check the seals and then store in a cool, dark place for up to 1 year. 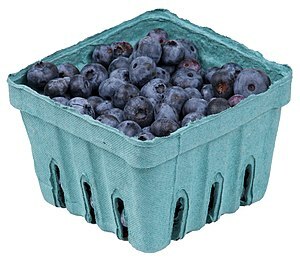 We received some fresh, local blueberries in our Produce Box this week and I can’t wait to use them! Will make some muffins for our campout this weekend and for me, nothing beats blueberries combined with some lemon. I love that flavor combination! I also like using buttermilk in my muffin recipes as it cuts through the sweetness and gives the muffins a fresh taste. Here is the recipe I use–you can substitute any other berry for the blueberries. I think raspberries would be terrific also! Preheat oven to 375 degrees. Grease 12 muffin cups or line with paper liners. Sift together flour, sugar, baking soda, baking powder, and salt. In a separate bowl, wisk together melted butter, egg, buttermilk and lemon zest. Fill muffin cups 3/4 full of batter. Bake until golden, about 18 minutes. Test for doneness with a bamboo skewer. Remove from oven and cool 10 minutes. Remove muffins from pan and cool on a cooling rack. Our weather this spring is just plain ol’ wonky. Last weekend was in the upper 50s and by Tuesday it was over 90. So things are a little confused when it comes to crops. The chilly weather slowed things down and then the hot, dry weather pushed some greens to bolt. Still, we have a lot to choose from and starting this week we will even have blueberries! Spending was on budget this week at $99.78, thank goodness, although we do have two fewer meals this week. Ellie and I will be heading out with our girl scout troop to a Hunger Games campout (no actual fighting to the death allowed, of course) so we’ll be eating around the campfire instead of at home. Tom will be fishing, so no one will be home eating! Our weeks are getting so busy and juggling eating our precious veggies is getting to be a challenge. 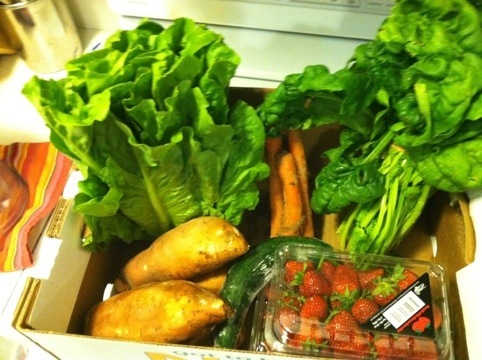 I’m thankful that our Produce Box gives us the option of skipping a week, although we haven’t had to do that yet. Here is what we’re having this week!